I've said it before and I'll say it again: 1980s fantasy-themed toys are awesome. And thankfully, there was no shortage of them produced. I'm forever grateful for the popularity of things like Masters of the Universe and the Conan the Barbarian movie, because they led to the creation of some amazing (and sometimes amazingly bad) cheap toys. 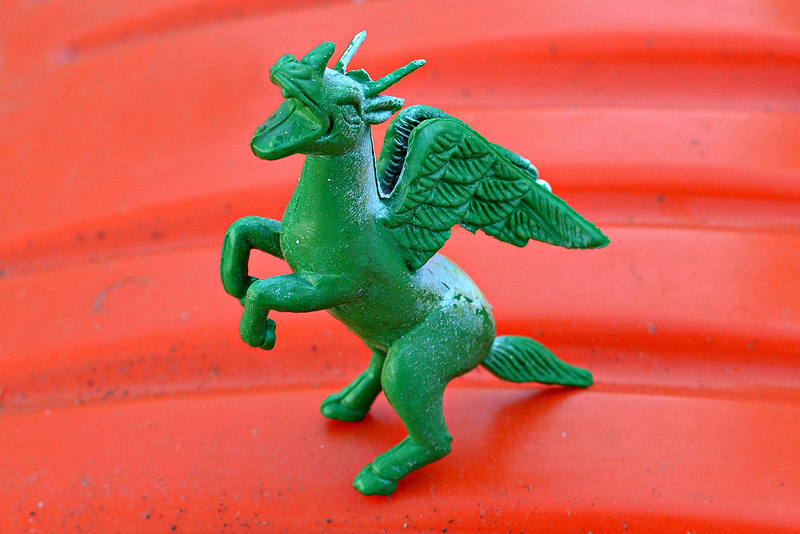 One such creation was a series of mythical beasts by the Imperial toy company in the early '80s. 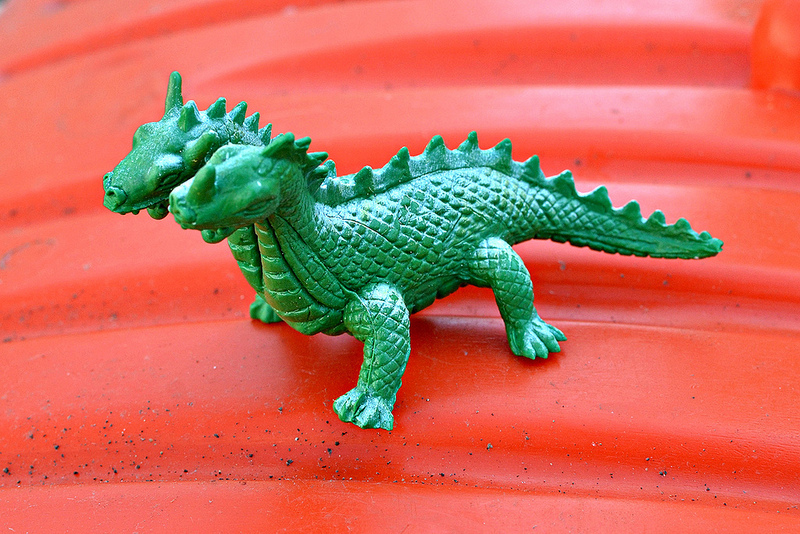 I know some of them were released under the name "Dragons and Daggers" (which you can see an example of at ToyArchive.com) Others might have been nameless. They consisted of creatures such as a winged horse, a unicorn and a two-headed dragon. Back in the day I imagine there were plenty of little kids to were a bit let down on Christmas and birthdays, expecting official Masters of the Universe merchandise, but getting Imperial figures and other knockoffs instead. Today, I'd personally love to unwrap a present and see these obscure weirdos staring up at me! 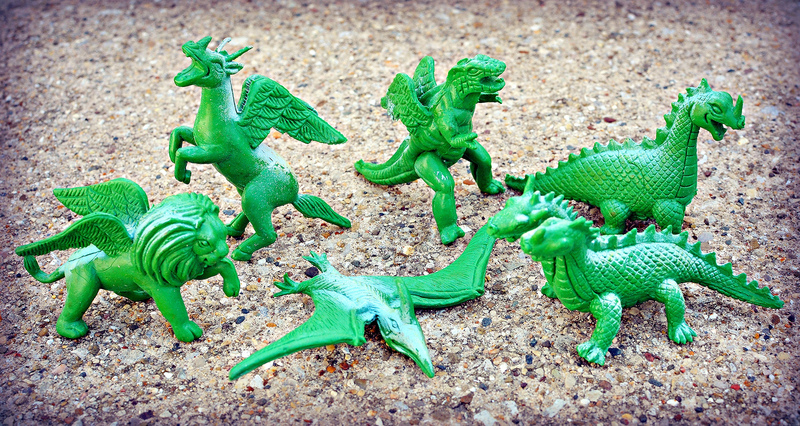 I recently came across the set of six rubber beasts pictured in this post, and immediately noticed that the winged horse is pretty much an exact replica of Imperial's figure from its Dragons and Daggers line, except this figure is much smaller (just under 3" tall, while the Imperial beast is around 9" tall). So, I can only assume that these dudes are knockoffs of knockoffs. I'm not sure where or when exactly these monsters originated as I got the set of six off eBay. My guess is that they could be found during the early-mid 1980s being sold at places like pharmacies and dime stores, and maybe even as carnival/arcade prizes. All they are marked with is "Hong Kong." They are made of soft rubber, and while my full set is green with white paint accents, I also saw them available in other colors such as yellow, black and red-orange. Here we have a two-headed dragon. For being a cheap toy, the sculpt actually has some nice detail to it, from the scales to the little teeth in both mouths. This winged horse guy is the one that is most obviously copied from an Imperial figure (unless it was the other way around, which I doubt). I like how it puts a bit of an evil spin on a pegasus. Here's a dino-like winged dragon. 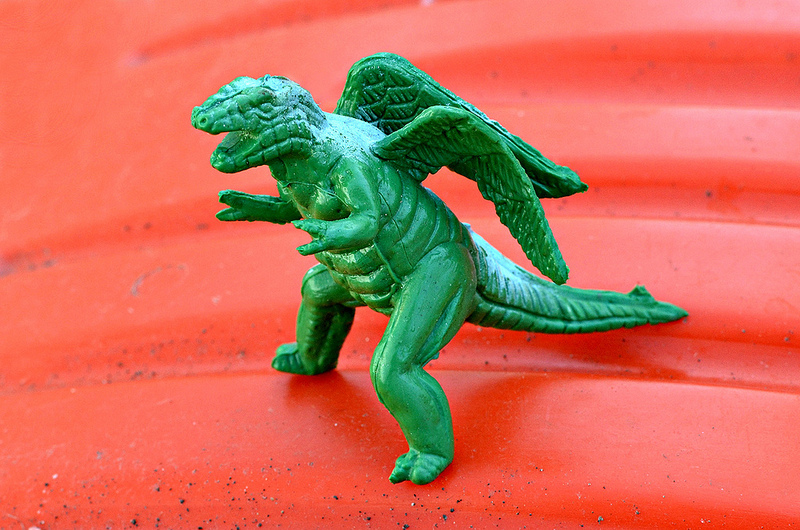 The wings are a bit wonky on mine (probably from years in storage), but I enjoy his tiny T-Rex arms. This winged lion is probably my favorite from the set. He's just badass! Here's another dragon, although this one has one head instead of two. I'm not sure what kid would have picked the one-headed dragon out of the box over the two-headed dragon, but whatever. This guy's still pretty cool. And finally we have, uh...a pterodactyl? I'm not sure what this is doing in a set of fantasy monsters. Maybe it was re-purposed from a previous set of dinosaurs or something? Also worth mentioning: I've got the two other figures pictured above, which seem to be based on these Imperial knockoffs, but are slightly different sculpts. They're made out of a firmer soft plastic and are somewhat cheaper-looking. Knockoffs of knockoffs of knockoffs, I guess? What about you? Do you have any additional info about any of these figures, remember seeing them anywhere, or own any yourself? Be sure to let us know in the comments! I think i might of had a couple of these as a kid and i kept them in a old cigar box along side my Diener erasers, green army men and odd-ball little cheapies. I've had figures like these [same smaller scale, too] since I was... probably six or seven. So, I would have received them during the mid- to late-80s. 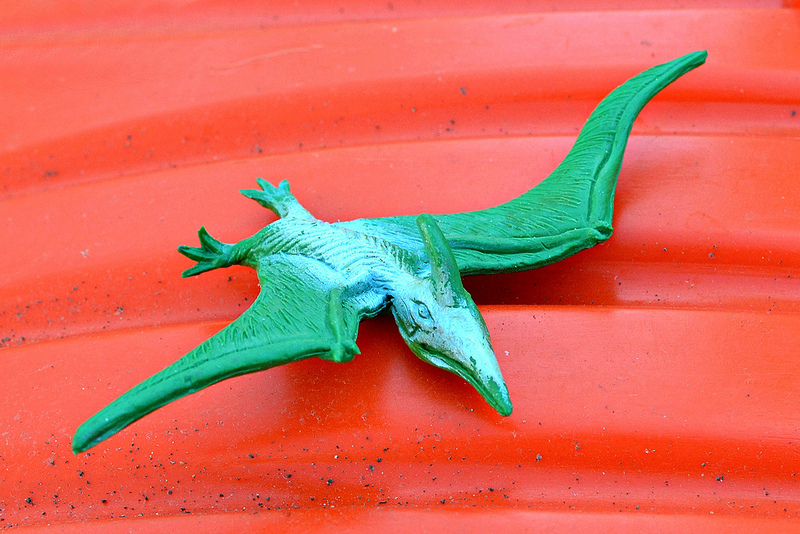 The exact same molds, minus the pterodactyl, but in two and three-toned colors. I'll have to take some pics. Just saw on Twitter...thanks for sharing! I know that feeling, haha. Hope you found it. Ooo! 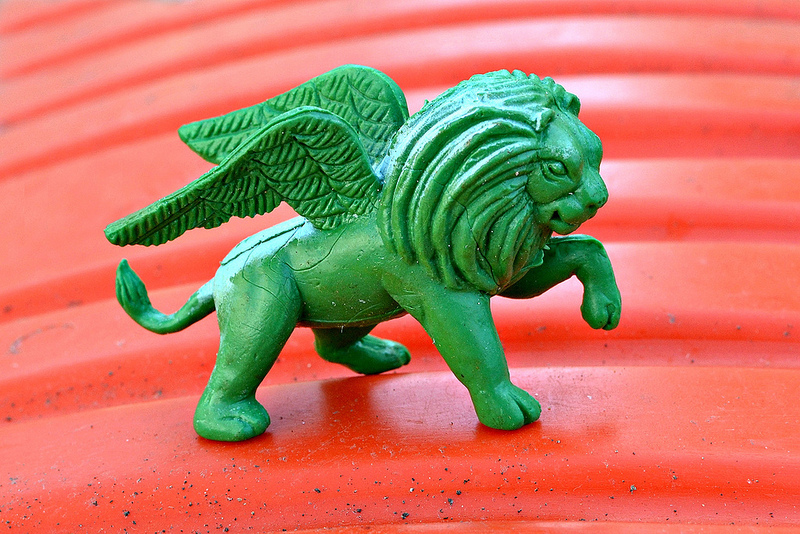 I'm pretty sure I have a two-toned hard plastic version of that winged lion! Cool, hope you were able to find it! I actually got a set of these prepainted on a birthday cake once! Haha, that's great. Fantasy monsters automatically make any cake twice as delicious. I remember going to a variety store with my Mom when I was like 6 or 7 (so figure 1985-86) called "Cheap John's". While there I got a pack of these little monsters. In it was that one-headed dragon in orange with light blue air-brushing, a yellow two-headed dragon with pink air-brushing, a red winged lion with darker blue air brushing, a yellow winged horse monster with green air-brushing and a red pterodactyl with I think white or yellow air-brushing. 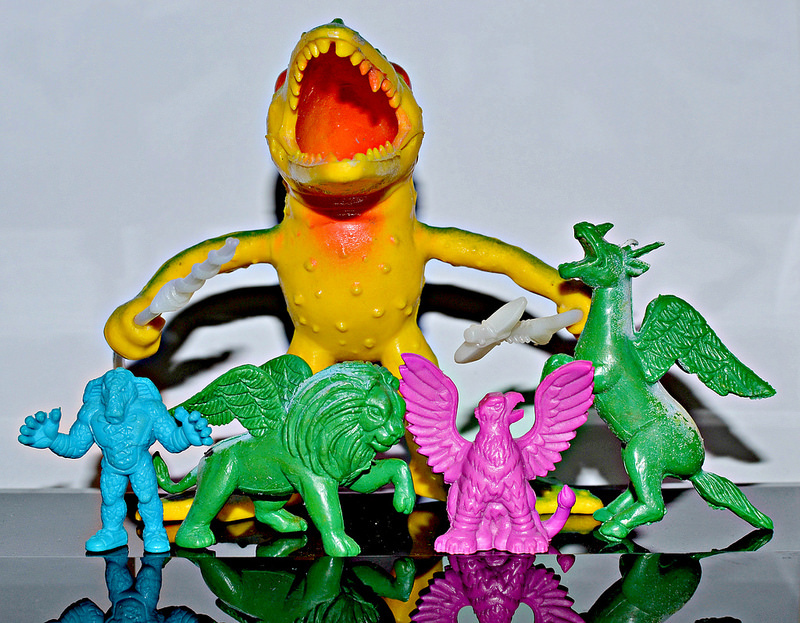 I have no memory of getting that winged dinosaur in the pack so maybe mine was just a 5-pack? Also, my monsters were of a soft, but very firm plastic so they really didn't deform much. 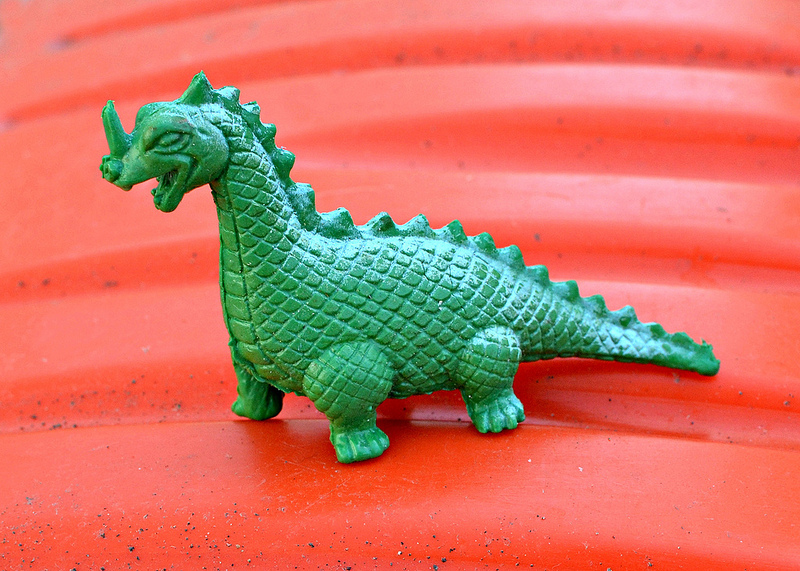 The little orange 1-headed dragon I know I still have, & I'm 85% certain I've seen that 2-headed one somewhere & the same goes for the pterodactyl. But the lion & horse must've flee off somewhere. Great memory—thanks for sharing. I miss those random variety stores and independent pharmacies where there was always cheapo fantasy stuff like this to be found. Thanks & me too. There is a mom & pop dollar store near me that gets some unique things around Halloween time but rarely any time other then that. I wonder why all those weird, monsters & creatures don't come out these days? I always loved those weird looking dinosaurs/animals with mouthes ready to devour anything they see. So much more creative I think. I definitely agree, although thankfully there seems to be a little pick up in weirdo toys these days...Mutant Mania, those Monsters vs. Military tubes and Slimy Sludge figures from Target, etc. Hopefully it continues. That cheapo fantasy/monster stuff you could always find at dollar stores in the '80s and '90s was the best, though. Just recently found some new colorful knockoffs of these! Inside of a Prehistoric Party Pack at a Zurcher's party supply store. Cool. I would be interested to see them if you post a pic.